Hair Mechanix is cruising Southeast Michigan! Did you see us at the Woodward Dream Cruise last weekend? The girls from Hair Mechanix Guys Haircuts were there supporting the worlds largest classic car celebration. For one day, 16 Miles of Woodward is full of classic cars, street rods, muscle cars, custom and collector cars, uniquely decorated cars and over a million classic car admirers! Did you know the Woodward Dream cruise started as a soccer field fundraiser in Ferndale MI in 1995? Now 20 year later, the cruise goes through the cities of Pleasant Ridge, Huntington Woods, Royal Oak, Berkley, Birmingham, Bloomfield Hills, Bloomfield Township, and Pontiac in Southeast Michigan. 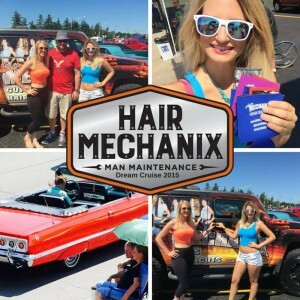 Dont Miss The Hair Mechanix stylists at the Hines Park Drive Cruise! The cruisin’ isn’t over yet! We will be there cruisin’ Hines Park Drive in the Hair Mechanix Hummer along with the classic cars and hot rods! This cruise goes from the Entrance at Ford Rd. and Outer Drive around the cities of Dearborn Heights, Livonia, Garden City, Westland, Northville, Plymouth MI and more! Along side of the cruise come find our amazing stylists that specialize in guys haircuts at our Hair Mechanix tent, for a raffle to win an auto detail bucket, American Crew guys hair care products and certificates for FREE Haircuts! When you get your free hair cut don’t forget to come visit us at one of our local guys haircut shops in Westland, Livonia, Southgate or Waterford, stay tuned for more locations.